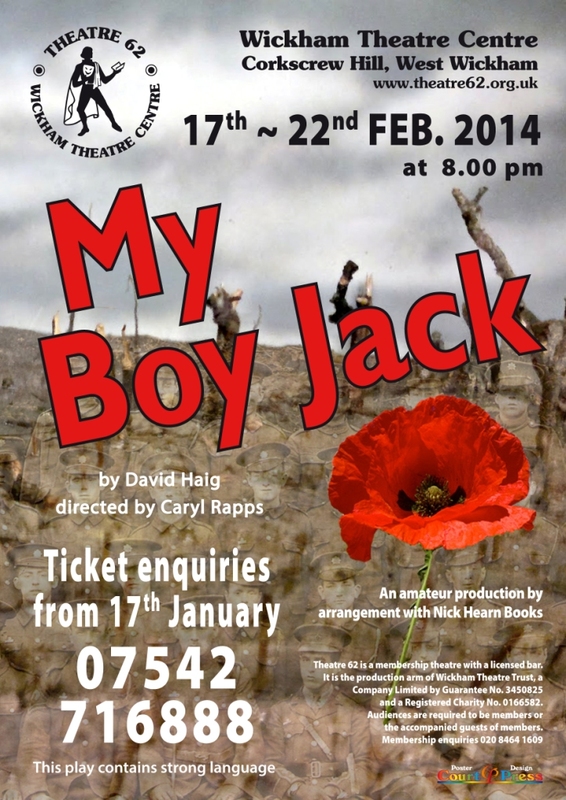 Our first production of 2014 will be My Boy Jack by David Haig, directed by Caryl Rapps. Read-through: Tuesday 15th October 8 p.m.
Auditions: Friday 25th October and Tuesday 29th October, 8 p.m. Character details will be published shortly. So says Carrie Kipling, Rudyard Kipling’s wife and mother of Jack (John) Kipling. My Boy Jack is a true story and tells of a nation at war offering an intimate portrait of one family’s complex and divided experiences in it. The author Rudyard Kipling, famous for the Jungle Book, uses his considerable influence, being on a War Office propaganda think tank, to get his nearly 18 year old son Jack admitted for military service during the First World War. Jack is only 16 years old at the beginning of the play and extremely short-sighted. Despite appearing eager to join the war effort he is repeatedly refused on account of his bad eyesight. However he is eventually enrolled in the Irish Guards, his father’s patriotic dream but his mother and sister’s nightmare. This play by David Haig is set in the main at Batemans in Sussex the home of the Kipling family but there are also scenes in the trenches. It is a powerful play showing the futility of war and how a family back at home react to their son going to war. The trench scenes are particularly poignant as are the scenes following Jack’s disappearance. 2014 is an appropriate time to perform this play with the 100th anniversary of the start of the First World War in August 2014.